A young man was self referred for dizziness, 3 years following resection of a cerebellar astrocytoma. 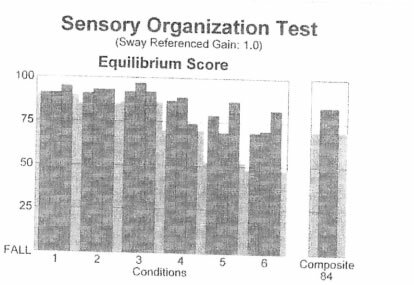 The main complaint was dizziness, and sensitivity to multiple sensory inputs. The images above show a cystic cerebellar astrocytoma, with a tumor nodule in the anterior portion of the cerebellum, and a large cyst in the left cerebellum, compressing the nodulus and flocculus on the left. The images above show similar sections after surgery. The anterior lower portion of the left cerebellum is resected. The flocculus appears to be absent, but the nodulus is probably still present. Computerized balance testing (CDP) was completely normal shortly after surgery. On examination, about 3 years after surgery, he had normal coordination and balance, but visual fixation was very poor, there was positional nystagmus, and vertical head movement as well as vertical OKN provoked torsional eye movement. Cerebellar astrocytomas are very slow growing and patients may appear very normal even with considerable findings on their MRI. Because they have "grown up" with their tumors, they have a better prognosis than other types of cerebellar masses. Cerebellar hemisphere lesions, even large ones like this, can be compensated for almost completely with time. Cerebellar flocculus lesions are associated with persistent poor visual tracking and fixation. Nodulus lesions are associated with positional nystagmus and sometimes, with wrong vectoring of vestibular responses. Patients with Medulloblastomas exemplify nodulus lesions.